Guess where all of the cool kids and people who like good bands are going to be on Wednesday's in June? They'll be at Pianos getting hot and sweaty with Jump Into The Gospel. You know how much we here at QNYC, aka Me, like them. 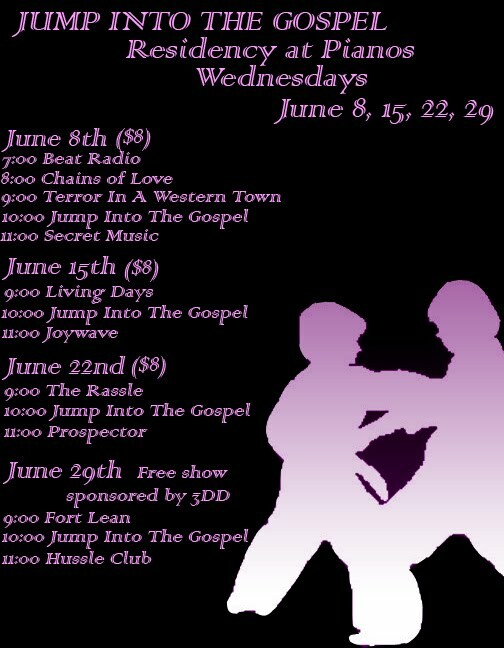 Beginning Wednesday, June 8 and continuing each Wednesday (6/15, 6/22 & 6/29) for the rest of the month, they'll take to the Pianos stage at 10PM. The shows will cost you $8 except for the June 29 show which is FREE, yeah that's right, I said FREE! So, you have absolutely no excuse for not seeing them at least once! Check out the hot promo video below that they put together for the occasion. OH! Did you see? Spank me and tickle me too, another QNYC fave, Prospector, will be on the June 22nd line-up!